The MAC 286 brush is a mix of both goat and synthetic fibres. It was originally released as a LE brush in the MAC Naturally collection in 2011, intended for use with the Mineralize Eyeshadows, and was released again in 2012 - as far as I know it's now a permanent line brush. It looks a little like a dual-fibre version of the Laura Mercier mop brush (another love of mine). The reason I love it is because it's sufficiently dense to use flat on its side as a lay-down brush. It is more than pointed enough to use as a crease/socket brush or for under-eye smudging of powder products. It is soft and flexible and makes for a fantastic blender brush. I've also been known to use it as an under-eye concealer brush. It can be used with powder, mineralised or cream products (I love to use it for a really quick smokey eye using MAC Constructivist Paint Pot). A brilliant little brush that does a lot of functions, I have several of these. The Japoneque large eye fluff brush (#234) is made from natural (squirrel) fibres and is a very large, dense, flat fluffy brush, which is beautifully soft. This one I use a lot for powder application, especially for sealing concealer under the eyes and on my nose. I use it for contouring my nose and cheekbones, and for highlighting my cheeks. I very occasionally use it for foundation. I have been known to use it flat-on to give a super-fast wash of colour to the lid, all the way to the brow, in two seconds flat. I can be used on its edge for quick blending-out of the socket. I'm never without one of these in my personal makeup kit, as it will do both face and eyes at a push. I've reviewed the Real Techniques brushes before here. This is a brilliant brush which unfortunately is only available as part of the Travel Essentials set. It's synthetic fibres (Taklon) are super-soft and this is my go-to brush for under-eye concealer and corrector, and occasionally for highlighter underneath my brow-bone or along the tops of my cheeks. It's sufficiently large enough and soft enough to use for a blending brush (its intended use) but I don't tend to use it for that particularly. This one is really brilliant; it's incredibly inexpensive and from the (more affordable) Essentials Range of brushes from Royal & Langnickel. 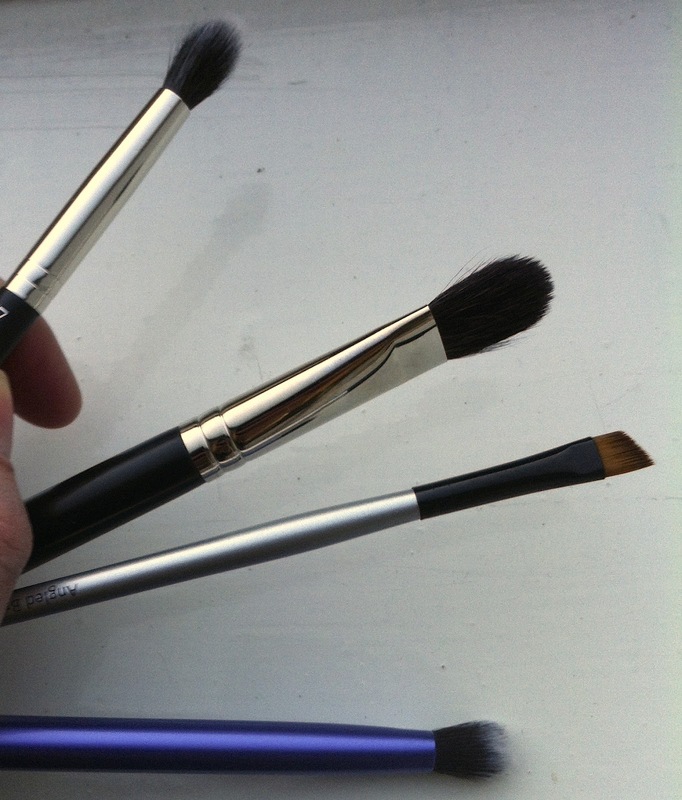 Made from synthetic fibres, it's the best angled liner brush I've got in my kit. It's quite pointed, quite dense, quite firm, usable with powder or cream, for brows or for eyeliner. I love this brush as it's slightly denser than the MAC or Illamasqua equivalents, can be used for brows or for eyeliner, and as an added bonus, is cheap-as chips! I bought a bunch of these at IMATS, but the ever brilliant love-makeup.co.uk stocks Royal & Langnickel brushes (and I believe there's a Pro discount on this range from the site). So there you have it. Between the four of those brushes I can do eyes, concealer, brows, liner, base, contour, blush and highlighter. And frequently do! You don't need to spend a fortune on makeup brushes, but it can be hard to know where to purchase good brushes. Some of the places online (or otherwise) that I purchase from, and some of the brands I love (drugstore brands, pro-, and some lesser known- brands), are featured in this post if you'd like some more information.